Dr. Seuss’ The Grinch will be available on 4K Ultra HD, Blu-Ray, & DVD on February 5th! We have a fun little Valentine’s Day gift that was sent to us from the studio and they are letting us give one away to a lucky reader. In the movie, the Grinch does a great job and taking his grumpy self and learning how to love Christmas and get along with others. The movie is a cuteness overload and has lots of funny moments. Our family loved all of the parts that included his dog, Max! 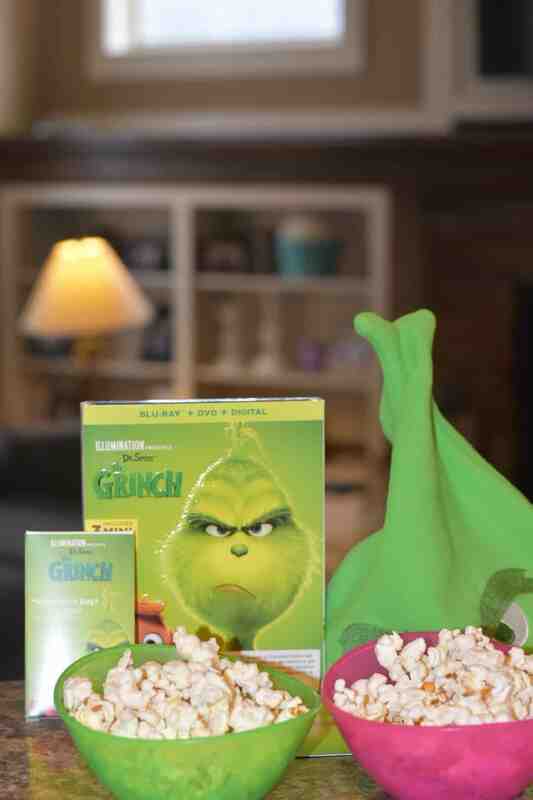 Dr. Seuss’ The Grinch DVD Review and Valentine’s Day Giveaway is sponsored. Our family loved seeing Dr. Seuss’ The Grinch when it was in theaters! If you purchase the Dr. Seuss’ The Grinch DVD/Blu-ray then you are going to love all of the special features that are included. Our family loves the mini movies and the bonus features! Dr. Seuss’ The Grinch is just as excited for Valentine’s Day as he is Christmas! My Valentine’s gift came with a note that asked “Did you sen these to yourself?” My green candy hearts in side read, “um nope”, “go away”, “hard pass”, “swipe left”, and “ugh”. The Grinch hat is just perfect for our winter cold blasts that have been happening across our area! We are excited to give away a copy of the movie along with these couple of prizes to one lucky reader. Please enter below! My least favorite holiday is Valentine’s Day. presidents day… another govt. day off thats not really needed. Probably Valentine’s Day. Always felt kind of forced. My least favorite Holiday is Thanksgiving. I usually have to work and I don’t like the food. Everything about it! The movies, the music, the time with family and the food! Honestly Valentines Day is my least favorite holiday. I just feel like it is a pointless waste of money and I may have had a bad “love” experience on Valentines Day as a teen that leaves a bitter taste in my mouth! I know this probably sounds a little ridiculous but Thanksgiving is for sure my least favorite holiday. I give thanks every day for who and what I have in my life. I also have big family dinners quite often, so Thanksgiving is just not a big deal. “What is your least favorite holiday? Why?” New Year’s Eve–it seems pointless! I think my least favorite holiday is Halloween. It’s always so cold and it was just a lot more fun when I was a kid. I am not a big fan of Halloween because of all of the scary images. Probably New Years Eve. I’m going to sound really old but there’s way to much alcohol, everybody is so loud, and then there are so many drunk drivers on the roads. I just hate it. I hate New Year’s Eve! The end of the year makes me feel depressed for some reason. I have to say Valentines day is my least favorite too commercial and too much pressure. The pressures at Christmas make it my least favorite holiday. If I didn’t have to stress over gift giving and just enjoy the season, it would be better. 4th of July is my least favorite because my entire family gets stupid drunk that day. LOL! I don’t have a least favorite holiday. They all have something fun to do. I would say New Year’s. I always worry about people out drinking and driving. Halloween 👻 Id rather buy my kids candy. Door to door is a bad idea. My least favorite is Valentines Day. I think it is a waste of money and profits the card and flower industry. I would say Halloween,because I don’t like going to the dentist all the time.